The Rolling Stones are streaming a lyric video for the track “2000 Light Years From Home”, as a preview to the September 22 release of a 50th anniversary reissue of the 1967 album, "Their Satanic Majesties Request", via ABKCO Music. Directed by Lucy Dawkins and Tom Readdy at Yes Please Productions, the animated clip presents the tune, which appeared as the B-side to the project’s second American single, "She's A Rainbow", and also peaked on its own at No. 5 on the German charts. 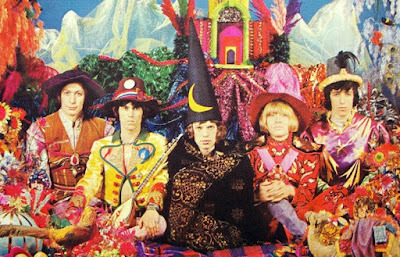 Originally released in December of 1967, “Their Satanic Majesties Request” is the first self-produced album in The Rolling Stones’ catalog. The record peaked at No. 2 on the Billboard 200 on its way to Gold status Stateside for sales of 500,000 copies. The 50th anniversary reissue will be available as a special Deluxe Edition box set containing double vinyl/double hybrid Super Audio CD (compatible with all CD players) that delivers both the stereo and mono versions of the project newly-remastered by Bob Ludwig. The 2017 reissue includes Michael Cooper’s original 3-D lenticular cover photograph, featuring the band at the peak of the psychedelic era, in a fold-out album limited edition numbered package with a 20 page book including more of Cooper’s photos from the original session. “Their Satanic Majesties Request” was originally mixed in both stereo and mono, as was standard practice in 1967. The limited edition 50th anniversary edition will include the entire album on 180 gram vinyl in stereo, another 180 gram vinyl record in mono, and two hybrid Super Audio CDs (one in stereo and one in mono). Each of these discs includes the entire musical content in both Super Audio CD (SACD) as well as standard CD, providing for complete backward and forward hardware compatibility; the discs will play on any SACD compatible or standard CD player. The Rolling Stones will launch the month-long No Filter European tour at the Stadtpark in Hamburg, Germany on September 9.